Sometimes an old photo can raise as many mysteries … as memories. One day my partner Rose, handed a old photo she had found in one of my books. Brother Bruce, mystery kid, Tom Wright , and Brother Doug. There are several mysteries surrounding this photo. Mystery 1: Who took the picture? I guess it had to be Dad? I don’t think any of us kids had a camera? Mystery 2: Who is the second guy from the left? I see Brother’s Bruce and Brother Doug, and our pal Tom Wright. But who is this other guy? ?? Maybe Bruce and Doug will know. I’ll ask. Mystery 3: Where’s Brother Richard – and myself? We were as fanatical about hockey as Doug and Bruce. The year is about 1963. The town is Drumheller, Alberta – in the “Dinosaur Valley”. That’s our house behind Bruce (left). We lived in the new Drumheller “sub division” and were considered to be rich by most kids. The house was fairly modest though. Just new. The rink they’re standing on is in the yard of the Catholic School which was obviously across the street from us. We didn’t go to the Catholic School. We weren’t Catholic. This rink had no boards. Most any hockey in small town Canada was played outdoors – though many towns did have some kind of covered rink. I don’t remember who periodically watered the ice. But I know who cleaned it most of the time. Us. It’s funny how many other kids would magically appear … after the rink was cleaned. Tots and figure skaters skated at their own risk though – there was a hockey game going on – for certain. Cold? I remember playing hockey when it was 30 below zero. Our feet and fingers would freeze and he’d go back inside – till everything thawed out. Then go back out again. We used gum boots for goal posts. Pucks were occasionally lost in the snow piles off-rink – and recovered in the Spring. We played all day – as possible – and played until it was too dark to see the puck. Lighted outdoor rinks were a luxury. The goal they’re standing in front of was made by Brother Richard from 2×4’s and chicken wire. It was a luxury too. And it lasted about one season. The equipment they’re wearing is really about all we had. Doug (right) is the only person wearing shin pads. (In ‘shinny hockey’ though you’re not supposed to raise the puck. BUT accidents do happen.) Hockey equipment cost money – and we didn’t have any. We could barely afford hockey sticks. The tape on the sticks was not for glamour – it was often the only thing holding the blade together. Skates were the main expense. In the pic, Bruce is the only guy with hockey gloves – which everybody would clearly (and dearly) have worn if they’d had any. Getting slashed on the hands and fingers was common – and painful. NOBODY wore helmets in those days. We got bumped, bruised, cut, and injured … sometimes broken. But we played on. It was our passion. Hockey in our house was war. Bruce and Doug were fans of the hated Toronto MapleLeafs. Richard and I were Montreal Canadien fans. You can only imagine. I think you might now have some understanding of how upset I get when I see how Hockey is being butchered these days – for money. No one cares about it’s History – it’s Heritage – it’s Traditions. It’s more than just an idle pastime for people of my generation. It was our life – our lifeblood. And it’s gone. Let us know when you find out who that is. Looks like it’s going to be a dead end. We musta known him .. but .. long ago. Tom was mostly Doug’s friend and the kid is standing next to Bruce so it’s probably Toschack. There’s was another guy who Bruce hung with too. I doesn’t look like Jimmy Parker. No it’s not Jimmy Parker .. nor big Gordon Lippolt (one of those guys who mysteriously manifested after the ice was cleaned). Toschak? Maybe. What was his first name? Do you recall? Thanks for your comments. What does it mean when they don’t even ask you? That’s hard to take. Yup there’s still some good stuff going on. I haven’t taken up residence in a cave just yet. Thanks. Jer pretty sure the kid next to me is Wayne Vockeroth we chummed around together for a while. Talking about 30 below hockey I can remember a frozen puck hitting a goal post and breaking in half. Also at 30 below your skates don’t grip the ice its like trying to skate on glass. 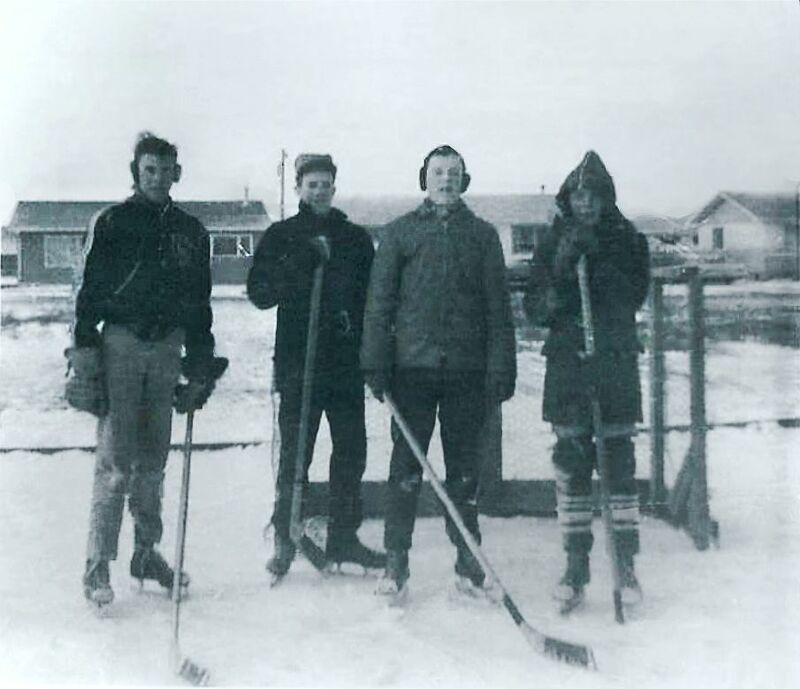 Remember playing hockey on the old slough in Brooks we would play until our feet froze solid and then go back to the house and holler like hell while they defrosted man that was painful, but of course after they warmed up out we would go again. You can’t beat a good time.